A few years ago, Diffraction Analysis released a white paper analysing the inception of Stokab, Stockholm’s municipal fiber network and it’s benefits for the City of Stockholm. Entitled ‘Stockholm’s Stokab: A Blueprint for Ubiquitous Fiber Connectivity ?‘ it was the first in-depth analysis of how Stokab came to be, what it’s key success factors were and how it could be replicated. At the time though the topic of Smart Cities was still mostly hypothetical and while our paper covered municipal e-services, it didn’t really delve into the connectivity driven opportunities to reinvent the urban environment. 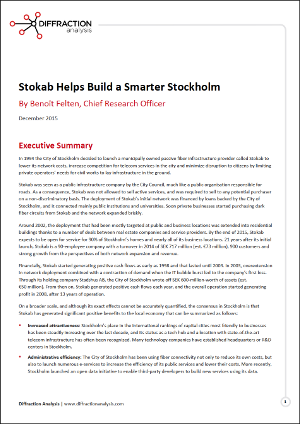 This led us discuss with Stokab the possibility of a refresh and expansion of the paper, and today we are proud to publish a new white paper entitled ‘Stokab Helps Build a Smarter Stockholm‘. This White Paper is available for free and can be freely distributed in its current PDF form. It covers not only the material presented in the original paper but also the approach to a Smart City that Stockholm is taking, the pilots it has launched and the role played by the municipal fiber network in turning vision into reality.